Pipistrel has built what looks to be, at least in the video below, an attractive and highly functional airplane in the WattsUp, an electronic conversion of their Alpha Trainer high-wing training aircraft. 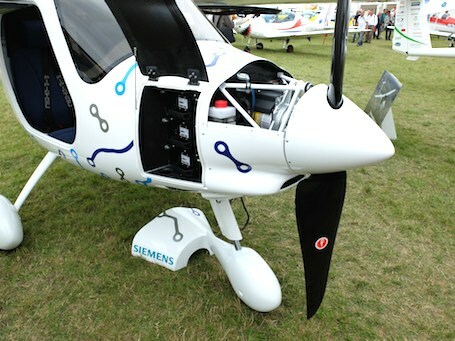 In the video, Tine Tomazic, responsible for electric aircraft design at Pipistrel, shows the ease of making battery swaps on the airplane, similar to those of electric motorcycles or scooters, and takes photojournalist Jean-Marie Urlacher for a ride around what your editor assumes is Pipistrel’s Ajdovscina, Slovenia factory and field. Note the conversational tone in the cockpit and the lack of headphones, one benefit of electric aircraft that would lead to their being great training aircraft. Aerobuzz, a French aviation blog, though, does lodge a complaint about the propeller noise: “Bit noisy (we hear only the sound of propeller),” but goes on to compliment other aspects of the craft. “Immediate start without engine warm[up], clean, easy to handle aircraft on the ground as Alpha Trainer, the WattsUp… would be the ideal training aircraft?” The airplane was introduced at last year’s Blois Fly-in. Jean-Marie Klinka, the author of the Aerobuzz entry, explains that the airplane has six 20-kilogram (44 pounds) packs of batteries, and an 85-kilowatt (114-horsepower) motor that weighs only 24 kilograms (52.8 pounds). The 18-kilowatt-hour batteries are charged outside the airplane, a process that takes 45 to 60 minutes and costs 2.15 euros (about $2.44 at this morning’s exchange rates). A site with existing solar panels or wind turbines could do it for free. This type of recharging would allow quick swaps (part of the pre-flight inspection?) but would require the use of, and investment in, duplicate packs to keep a busy club or flying school in the air. The one-hour endurance for the fully-charged airplane limits the trainer to touch-and-go circuits around the local field for now, although Pipistrel claims that using the regenerative power of the broad propeller on a steep approach will add one orbit around the field to every six. Even a doubling of existing battery energy density will allow more practical use of the aircraft, and the 5X batteries being pursued with Department of Energy grants in this country would provide real-world acceptance for this type of trainer. If Pipistrel achieves the 100,000 euro ($112,000) price tag Klinka lists as a hoped-for achievement by the company, the electric WattsUp should be fairly competitive with even their Alpha Trainer, and when gas prices rise again, more than competitive on operational costs.